SEGA® of Europe ltd. recently announced that the classic arcade game After Burner™ has returned for a new generation of gamers. Developed by Fishing Cactus, After Burner Climax™ is a universal app compatible with iPhone, iPad, and iPod touch and is available for £1.99 on the App Store. 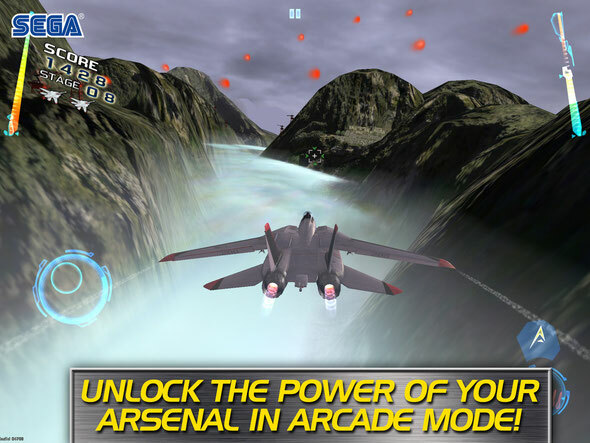 After Burner Climax is a fast and frantic arcade-style action game that puts fans in the cockpit of the world’s fastest fighter jets. Fans will utilize both tilt and touch controls to dodge missiles and bullets while trying to target multiple on-screen enemy aircraft. Built for all skill levels, anyone will be able to take to the air and soar through a branching storyline of more than 20 stages. Players can select from the F-14D Super Tomcat by Northrop Grumman, the F-15E Strike Eagle or F/A-18E Super Hornet by Boeing and personalize their plane with four different paint jobs. By mastering levels, players can unlock power-ups and climb to the top of the leaderboards. Check the trailer below.